Congressman Flores discussed fighting the opioid epidemic. Congressman Flores answered a question about border security. Congressman Flores responded to a question about gun control. 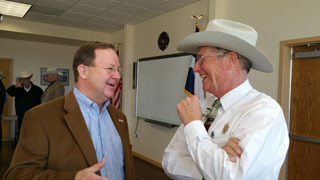 Congressman Bill Flores held this Access Live Video event to discuss and debate critical issues with constituents in the 17th District of Texas. Among the topics addressed were school safety, border security, and the opioid epidemic.